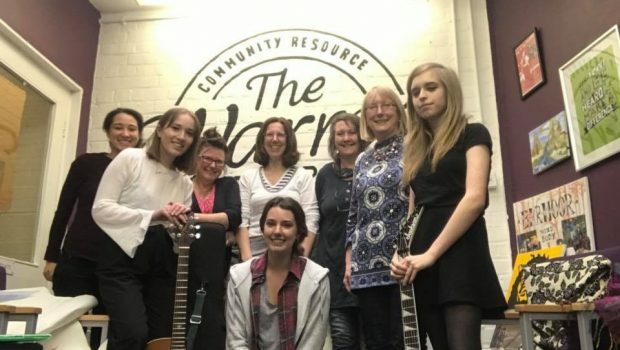 Part of PRS Foundation’s New Music Biennial Composer Residency programme and in partnership with The Warren, Creative Voice and Kingston Youth Centre, Women in Music Hull has been offering a series of workshops with visiting successful female songwriters, musicians and a sound engineer. The latest workshop led by songwriter Ali Bullivent saw a group of 7 women co-creating music together. They looked at writing songs, the creation of supporting harmonies and wrote one song as a whole group. Nadine Shah, Hannah Miller, Raevennan Husbandes, Michelle Scally-Clarke (Dub Poet), Caroline Adcock and Ali Bullivent have been running workshops with women making music in Hull over the last few months. There’s a chance for young women to work with Ali in the final workshop of this series on Saturday 21 April, at the Warren. It’s FREE and open to young women under 25.